One of my favorite movie speeches of all time is Al Pacino’s from Any Given Sunday. It’s the one where Pacino – who plays a pro football coach beaten down by life – is talking to his turmoil-ridden team before a big playoff game toward the end of the film. The lines from that speech that standout are the ones about inches. About how life is a game of inches and how important those inches are. How those inches are difference between winning and losing (living and dying). How those inches are all around us all the time and how we need to fight, scratch and claw for those inches. It’s one of those speeches that make you want to run through a brick wall like an amped up version of the Kool-Aid Man with five Red Bulls running through his system. Inches. In journalism writing, usually that’s how stories are measured. You get assigned a story and your editor tells you have six or eight or 20 inches to fill. But the inches have been getting harder for me to fill in recent months. Little bit of a confession here: I haven’t felt the urge to write on a personal level in a long while. It’s weird as a writer to admit that. Does an eagle ever lose its desire to soar in the sky? Does a fish ever not want to swim? I would imagine not. That’s kind of what they are designed to do. They fly. They swim. For a long time, I felt like I was born to write. So, why am I not writing like I used to? Where did the words go? Whenever I've tried to write for this space in the last few months, I’ll start writing and then the words just taper off, either because my train of thought seems to go nowhere or my heart just isn’t in it. It’s frustrating. It's like turning the key into the ignition of a car and being greeted with nothing. That’s what this feels like: It feels like I’m running on a dead battery. And you can’t run on a dead battery. It feels strange. And it goes beyond just wanting to write. I want to want to write. I want to wake up first thing in the morning and have the words just flow through my fingertips, through the keyboard and onto the screen. That’s not happening. But the truth is, that rarely happens. If it does happen, awesome. But if I'm waiting until I feel like that to start writing… well, that’s how I’ve ended up where I am. 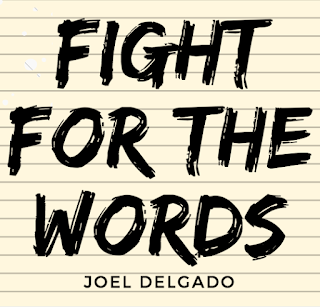 You have to fight for the words. You have to fight for the inches. Fight and struggle and scratch and claw until the words come out. And they might not be pretty words, but that’s okay. You can work with ugly, not-so-well-written words. But you can’t work with no words. You can always work with something, but you can’t work with nothing. So this is my "something." This is me grabbing the jumper cables and trying to recharge that dead battery. This is me trying to fight for the inches around me, because those inches are still there. The words are still there. They always have been, and they always will be. I just have to find them -- and then work harder to seize them. And that takes work. It was never supposed to be easy, I'm realizing now. It's supposed to be hard. As long as we have breath in our lungs, we’ll have the choice whether or not to fight for those inches or not. Those inches can represent anything in your life that helps you move the ball down the field -- the words you write, the sales you make, the paintings you draw, the miles you run, the songs you sing, the time spent with God. What are those inches for you? Lord, help me to keep fighting for those inches, even when I don’t feel like it. Especially when I don’t feel like it. If it's the last thing I do, I'm gonna fight for these words and the ones to come. I’m gonna fight for the words. After read this entire information I not found any helping material. Since this time I want to read more through a few connections. Which might be hard to discover however might be this is beneficial for us to get it. Yes fight for the words.Your blog is so inpirational and its best help for resume making.Although www.typingservice.org/type-a-resume-with-us/ is really great site but your post really amazing. it is not a piece of cake to become a director and if you want it so early then it become more difficult but if you are really into it then you can make it.good site for the students that is very helpful for the writing services. That is the willingness of the student that keeps him alive and up to date that what is happening in the market to have ideas here and implement those ideas in a unique way. That's the readiness from the college student which retains him or her in existence as well as current which what's occurring on the market to possess suggestions right here as well as put into action individuals suggestions inside a distinctive method. You may check it at http://www.manualwriting.net/our-manual-writing-services/help-with-writing-an-operations-manual/.